India’s growing tribe of luxury consumers is more traveled, more discerning, and more demanding than ever before. Gone are the days when multinational companies could get away with introducing outdated models or offering limited product selection to the Indian market. And it’s no longer enough to ride on the halo of global brand image when selling to Indian consumers. In the Indian context, the delivery and experience of a luxury brand are much more critical than the product alone and the badge value of owning it. Indian consumers might notice the Louis Vuitton logo and be enticed by an impressive lifestyle ad in a glossy magazine, but it’s the Louis Vuitton experience across all interactions that will shape their perceptions of the brand. Positive perception is key to driving purchase and loyalty, and therefore long-term business success. Given the high import duties on luxury goods in India, it’s all the more essential for companies to deliver an outstanding brand experience: In most cases, the product itself can be purchased more cheaply in Hong Kong, Singapore, or Dubai. To increase their chances of success in India, luxury brands need to think of the brand experience as the customer journey—the interaction between customer and brand throughout the relationship, from awareness and consideration to purchase and loyalty. Taking such a holistic view allows a deeper, more nuanced understanding of luxury customers’ needs and enables brands to create a differentiated and relevant brand experience. India is truly an idiosyncratic market for a vast array of social, economical, cultural, and political reasons. Even such global giants as Coca-Cola and GM did not meet with success when they entered this market, due largely to a lack of understanding about Indian emotions, habits, and lifestyles. Kellogg’s initially had great difficulty selling its products in India because the cereal company failed to grasp one key consumer insight: Indians like to start the day with a hot meal. While the lack of high-end retail space is cited as the biggest challenge for luxury brands, there are several other considerations that marketers should take into account. First, luxury consumers in India are not a homogenous, easily characterized group. Beyond the traditional rich, there is a new generation of affluent consumers with different attitudes and mindsets towards wealth, lifestyle, and luxury brands. They may be newly minted CEOs and other senior corporate professionals; entrepreneurs in businesses such as IT and telecommunications; returning “prodigal children” (affluent Indians who have lived abroad and continue to favor Western brands); franchisees and retailers; or politicians, bureaucrats, and media personalities. Each group may view luxury goods differently, from valuing them for their functionality to treating them as a reward or an indulgence. Orientation towards badge value varies as well. Luxury brands need to study the unmet needs and wants of these customer types to determine how best to differentiate the brand experience. Second, sales staff in retail stores have the power to make or break the shopping experience. Many consumers, especially the new generation, will be unfamiliar with the luxury brand; they depend on salespeople to provide information and facilitate the buying process. Lack of knowledge about the brand or product creates a negative impression. Traditional wealthy and globally traveled consumers, on the other hand, expect the highest level of service from sophisticated and well-groomed staff. Companies need to invest heavily in training sales staff to handle luxury buyers of all stripes. In addition, staff must not be arrogant about which customers they choose to serve when someone walks through the door. Women dressed in sarees who don’t speak English well may have pots of money to spend, but if treated improperly by sales staff may turn away from the brand forever. Indians love to share their experiences, and a dissatisfied consumer can quickly erode the reputation of a brand via his or her circle of influence. Third, luxury brands in India typically manifest a lack of attention to detail. The gift wrapping or quality of finishes at a retail store may not meet the highest standards of these brands. 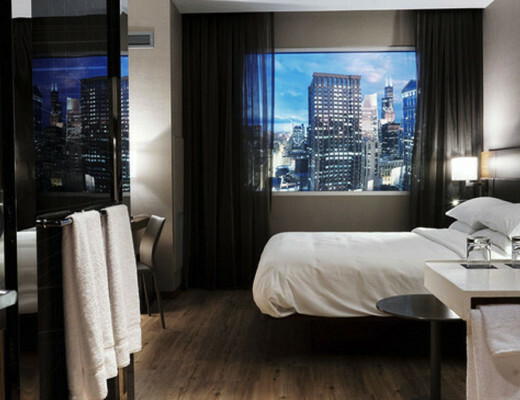 Customers who are used to top-notch brand experiences in cities such as New York and Paris are frustrated when they don’t receive the same treatment from global brands in India. They may end up feeling they are paying for quality they don’t receive. 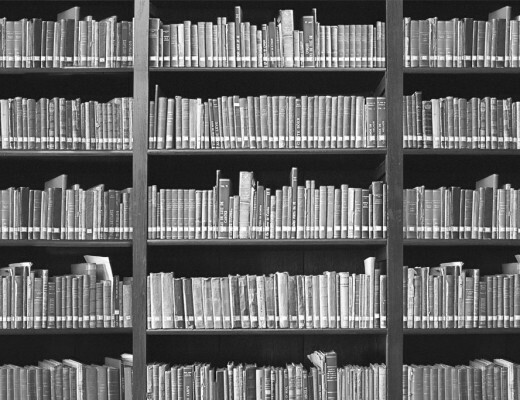 These challenges, though considerable, can be overcome through innovative thinking. While it may not be possible to perfectly manage all interactions with the brand, focusing on one or two key touchpoints of the luxury brand experience can powerfully ignite customer excitement and create a positive impact. This not only elevates the brand, but also allows it to take a few liberties in other areas with less danger of losing customers. British Airways (BA) illustrated this concept when it created a unique check-in service at the Chhatrapati Shivaji International Airport in Mumbai. Business class travellers entering the terminal were immediately whisked into a specially designated area. After a streamlined check-in process, they were escorted through security and immigration straight to the main lounge. This hassle-free experience was so appealing that business customers were willing to forgive other blips such as delayed bags (for which BA was famous in India). 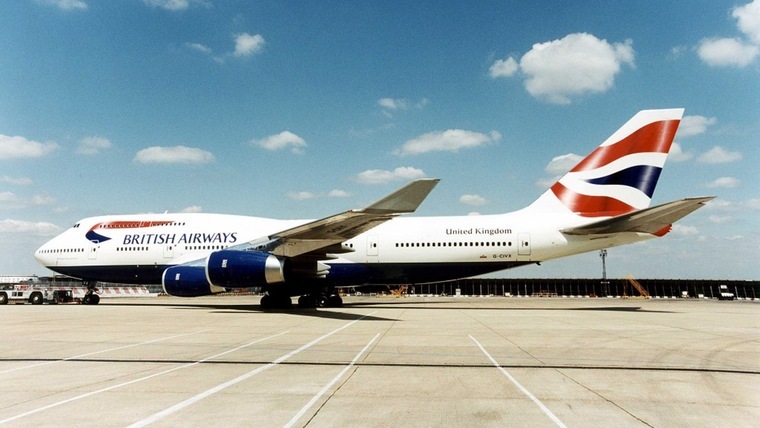 Finding a memorable and relevant way to manage check-in succeeded in differentiating BA, because no other airline offered this to its valued clientele. The customer journey framework has immense practical value for managing and influencing customer perception, allowing a helicopter view of all touchpoints in the brand experience. The marketer can then drill deeper into any particular stage of the journey to better understand customer needs at that stage and assess how the brand—or its competition—is responding to those needs. Most importantly, it allows the marketer to make key strategic decisions on choosing where to amplify delivery of the experience and make a real difference to the brand. 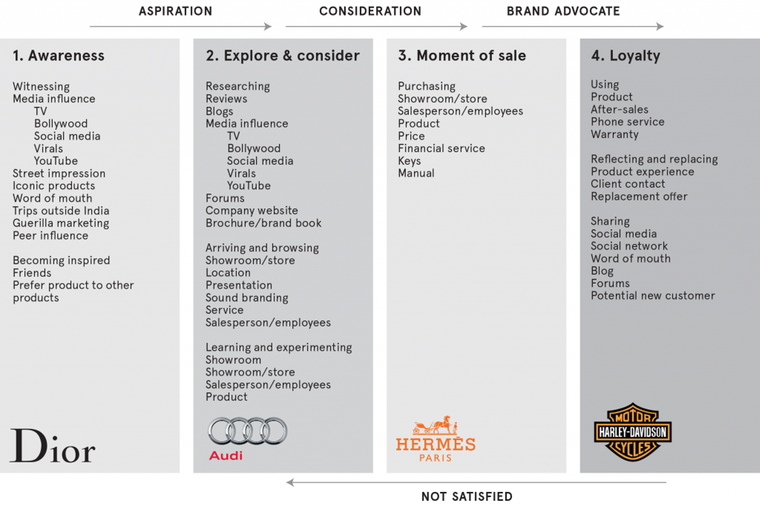 Figure 1 shows all stages of the luxury customer’s interaction with the brand, from awareness (learning that the brand exists) to explore & consider (thinking of buying) to purchase (going online or to a store) to postpurchase (staying loyal). 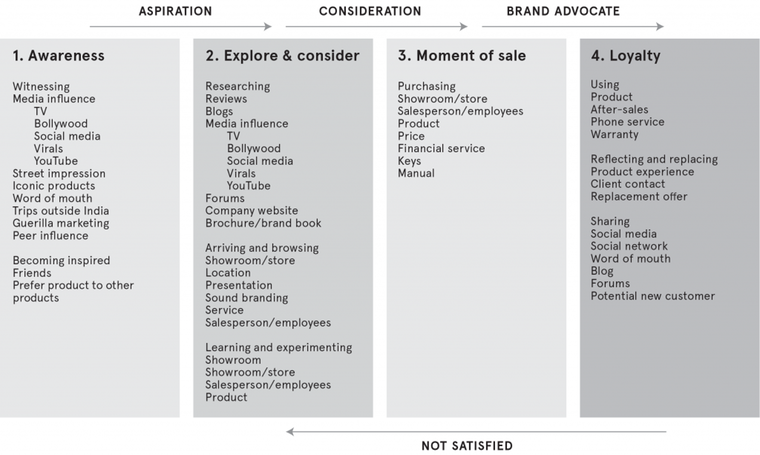 For each stage, generic touchpoints are listed for luxury brands to consider. The next level is to plot the needs of different customer types at each stage. In the awareness stage, for example, the traditional rich customer wants reassurance of the global brand values within the Indian context, while a first-time luxury customer may be looking to understand and appreciate the brand’s credentials. Once the stated and unstated needs are plotted, brands can then determine their response. Some marketers also like to plot how their competitors’ brands are dealing with these needs. This enables them to identify opportunities that competitors are not focused on and can therefore be differentiated to deliver an outstanding experience (Figure 2). Because it is not realistic to excel at all stages and all touchpoints, brands must first understand the entire journey and then choose where to amplify the brand experience. We’ll look at four high-end brands to see how they emphasize particular stages of the customer journey to support their brand strategies. These mini cases demonstrate innovative tactics to generate awareness, maximize chances of purchase consideration, elevate the purchase experience, and build loyalty for the brand. The iconic French brand Dior has adopted an unusual approach to generating consumer awareness for itself in India. Its representative is not an internationally recognized celebrity or even a Bollywood star, but an Indian socialite with an impressive list of potential Dior customers. Kalyani Chawla is both vice president of marketing and communications at Dior India and its walking, talking brand ambassador, recruiting customers with the same ease and élan that she sips her champagne. She understands the world of über-luxury globally and French brands in particular, having gathered deep insights on luxury retail in her homeland from her association with the Indian brand Ravissant. Chawla—typically dressed only in Dior—is a total personification of the brand. She has smartly positioned herself in the highest circles of society as the go-to person for the latest tips on fashion, style, and even entertaining. Tapping into her extended social network, Chawla has generated tremendous awareness and aspiration for the brand with its target clientele and succeeded in building a community of Dior loyalists. She has also become an accessible part of the Dior story in India, increasing the brand’s relevance and appeal. Her personal relationships allow her to get firsthand, frank comments on Dior customer satisfaction. Such constant feedback permits better selection of products, fine-tuning of the experience, and improved response to customer needs. Dior also invests heavily in the awareness stage of the customer journey by doing two things very well: product placement and PR. The brand scored a real coup in product placement with the Bollywood film Aisha. Sonam Kapoor, its lead actress, sported as many as 60 Dior dresses and accessories and carried her Lady Dior purse throughout the movie. The male lead, Abhay Deol, wore Dior creations as well. And Dior has been aggressive with its PR moves, securing 20 magazine covers in 2010 alone. With such attention to awareness building, you might expect Dior to have a dozen or so stores in India. Actually there are only two, one in Mumbai and the other in New Delhi. But the brand is well prepared to increase its presence in India, and its investment in awareness development will give it a huge advantage when expanding. Audi, the German car brand, also invests heavily in creating awareness and pull for its autos through advertising, sponsorships, and publicity. But where Audi has really excelled is in developing an engaging experience for Indian customers—both offline, through the design of its dealerships, and online, by means of a 3-D campaign for the launch of its new A8L model. 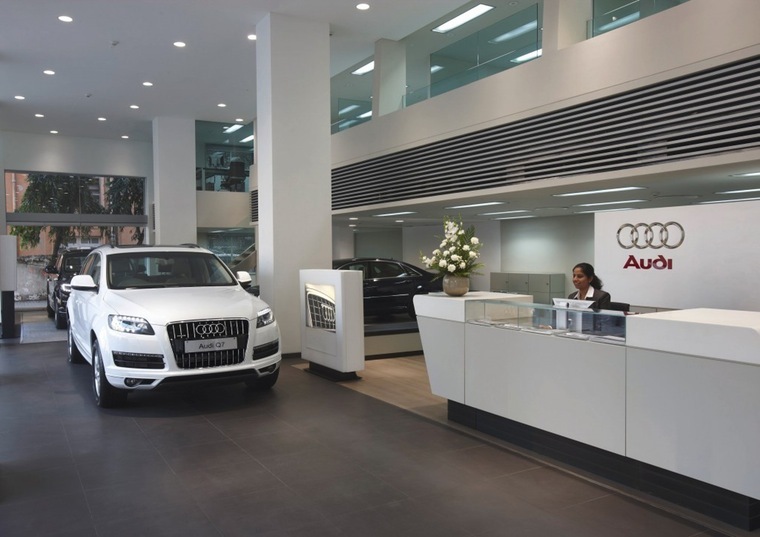 The Mumbai West showroom is a personification of brand Audi. Potential buyers feel the brand’s sportiness, progressiveness, and style throughout the experience, not just in the cars themselves. The spacious showroom is minimalist in design but luxurious in feel. 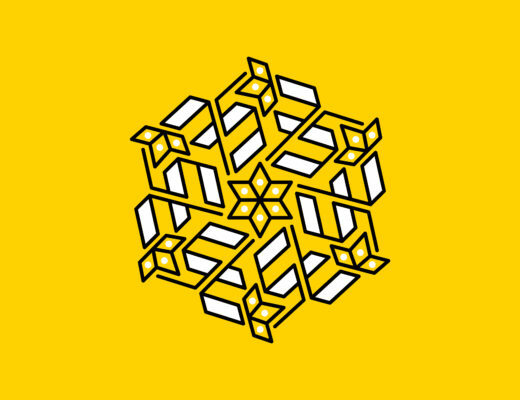 Every detail—from the flowers used in vases to the kind of coffee served—has been carefully managed to craft an Audi brand experience for customers. Audi calls this a “terminal” concept that combines the efficiency, performance, luxury, and environmental themes of its brand. The showroom façade is a unique aluminum honeycomb with the full lineup of cars clearly visible from the main road. The back wall of the dealership—a curve simulating the turns of racetracks—pays homage to Audi’s roots in motor sports. Display areas have been designed to maximize customer interaction with the vehicles without the need for a salesperson. Shoppers can drop off their children in the play area or stop at the cafeteria for a snack. They can also buy a variety of Audi-branded merchandise, a small consolation for those who cannot afford the cars! The launch of Audi’s A8L model was particularly innovative. The company created one of the world’s first integrated 3-D campaign to allow potential buyers to live the brand even if they could not physically test-drive the vehicles. A 3-D film shows the car in all its beauty, and a microsite permits users to learn about the model. Traffic to the microsite was driven by a direct marketing campaign in which custom-made, high-quality Audi anaglyphic 3-D glasses and 3-D car brochures were sent to prospective buyers, inviting them to explore the new model online. Both the film and the web experience will be further developed on touch screens and 3-D screens in showrooms. Such an approach to the customer experience enormously enhances the brand’s attractiveness in the eyes of potential buyers. Audi has strongly differentiated its dealerships in line with its brand values, driving greater affinity and therefore greater sales success in India. Luxury brand stores in India are typically found either in high-end shopping malls like DLF Emporio in New Delhi or in five-star hotels such as the Taj. 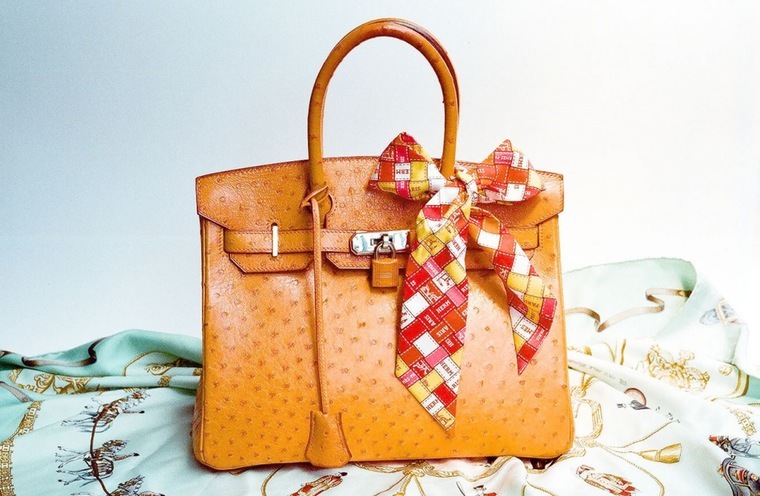 But Hermès understands the paramount importance of creating a retail experience for its Indian customers on a par with those in London, Paris, and New York. After establishing its first two locations at the Oberoi Hotel in New Delhi and the Ista Hotel in Pune, Hermès chose to side-step existing infrastructure for retail and invest in a stand-alone flagship store in Mumbai. Located in the historic Ballard Estate area of South Mumbai, the 3,500-square-foot space embodies the spirit of the brand, extending to every parameter: spaciousness, product selection, and quality of service. The store, spread over two floors, provides ample room for exploration of and intimacy with the full range of Hermès products, from its customized Indian sarees to the ragingly popular Birkin bag. The staff are nonintrusive, yet manage to be on hand the moment a customer has a question. They are impressively knowledgeable about the brand and surprisingly sophisticated compared to most luxury brand salespeople in India. Hermès has also replicated its global model by including an art gallery in the flagship store. This brand-savvy move enables a stronger connection with the target customer who is time-starved, cash-rich and seeking cultural inspiration. Soaking in some art and sipping coffee in the upstairs café of the store “warms up” the customer, creating an emotional bond in which the brand comes to symbolize a whole way of life. Shoppers can always buy a small piece of Hermès before they leave—there’s the selection of perfumes and scarves for that. By building its own store from the ground up rather than moving into existing retail space, Hermès has full control over the design and implementation of its desired brand experience. Hermès is able to live its philosophy and truly delight the Indian luxury customer, who has often been disappointed by the experiences other brands deliver. Most luxury brands in India forget about their customers the moment a transaction has been completed. Harley-Davidson, however, organises rides and events that give Indian bike lovers a full brand-ownership experience. Harley dealers act as sponsors of local Harley Owners Group (HOG) chapters, creating a forum for bike owners to meet, interact, and share their passion for biking within a community. India currently has four HOG chapters, located in Delhi, Mumbai, Bangalore, and Hyderabad. Through HOG, Harley-Davidson is able to forge a deep loyalty in its customer base, making it easy for Harley owners to recruit friends into the fold as well. They have a ready-made platform in their Motorcycle Boot Camp, an immersive experience designed to create high levels of aspiration for the brand. In a similar vein, Harley Rock Riders brings together even more potential for existing riders. The live concert event, conceptualised by Harley-Davidson India and Rolling Stone India, combines live rock music with a celebration of Harley values. This ongoing holistic experience nurtures Indian customers’ relationship with the brand. 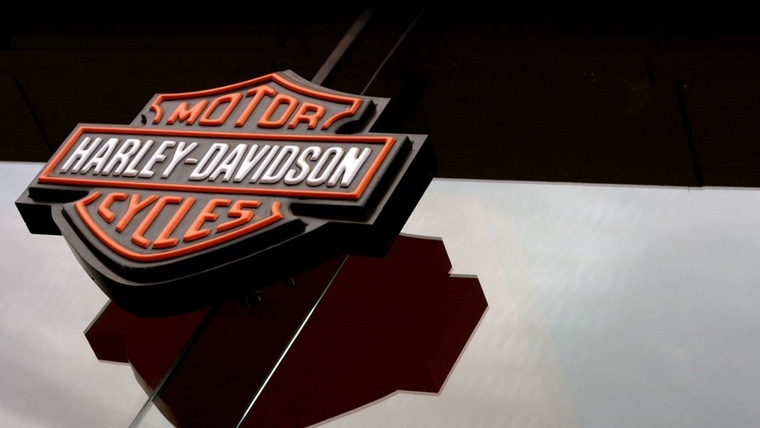 In a country where many luxury brands are distributed by local dealers, which may compromise the experience, Harley-Davidson’s official presence is a huge plus when it comes to providing after-sales support and servicing. The Harley example shows that investing in loyalty and encouraging shared passions among customers can multiply brand awareness and affinity. Experiential marketing views consumers as emotional beings who are focused on the pleasurable and meaningful aspects of brand interaction. Working with the customer journey model can help marketers develop a competitive, differentiated luxury brand awareness. As Dior, Hermès, Audi, and Harley-Davidson all demonstrate, the focus on customer experience enhances perception, encourages purchase, and builds brand loyalty. The ability to create and deliver innovative brand experiences has become an important core capability for luxury goods. Brands who go beyond offering more than product excellence and position themselves in the market experientially will achieve a sustainable competitive advantage in India. This blog was originally published by The Luxury Market in India: Maharajas to Masses (Palgrave, 2012).